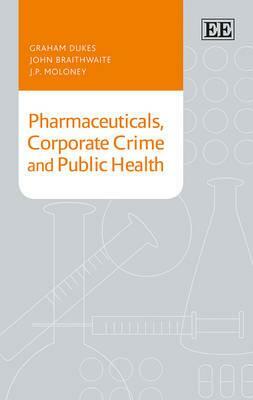 G. Dukes, J. Braithwaite, J.P. Moloney (2014) Pharmaceuticals, Corporate Crime and Public Health. Cheltenham: Edward Elgar. J. Braithwaite (2013) ‘Strategic socialism, strategic privatisation and crises’ Australian Journal of Corporate Law 28(1), 35-59. J. Braithwaite (2010) ‘Diagnostics of white collar crime prevention’ Criminology & Public Policy 9(3), 621-626. J. Braithwaite (2009) ‘Restorative justice for banks through negative licensing’ The British Journal of Criminology 49(4), 439-450. J. Braithwaite (2008) Regulatory Capitalism: How it Works, Ideas for Making it Work Better. Cheltenham: Edward Elgar. J. Braithwaite, T. Makkai and V. Braithwaite (2007) Regulating Aged Care: Ritualism and the New Pyramid. Cheltenham: Edward Elgar. J. Braithwaite (2005) Markets in Vice, Markets in Virtue. Sydney and New York: Federation Press and Oxford University Press. J. Braithwaite and P. Drahos (2002) ‘Zero Tolerance, Naming and Shaming: Is There a Case for it with Crimes of the Powerful?’ Australian and New Zealand Journal of Criminology 35(3), 269-288. Winner: Allen Austin Bartholomew Prize for the best article published in the Australian and New Zealand Journal of Criminology, 2003-2004. J. Braithwaite (2001) Conceptualizing Organizational Crime in a World of Plural Cultures in H.N. Pontell and D. Shichor (eds) Contemporary Issues in Crime Criminal Justice. Essays in Honor of Gilbert Geis. 17-32. Upper Saddle River, NJ: Prentice-Hall . J. Braithwaite (1995) Corporate Crime and Republication Criminological Praxis in F. Pearce and L. Snider (eds) Corporate Crime: Contemporary Debates. Toronto: University of Toronto Press. 48-71. (Revised version in Nikon University Comparative Law Journal 11, 1994, 123-150). 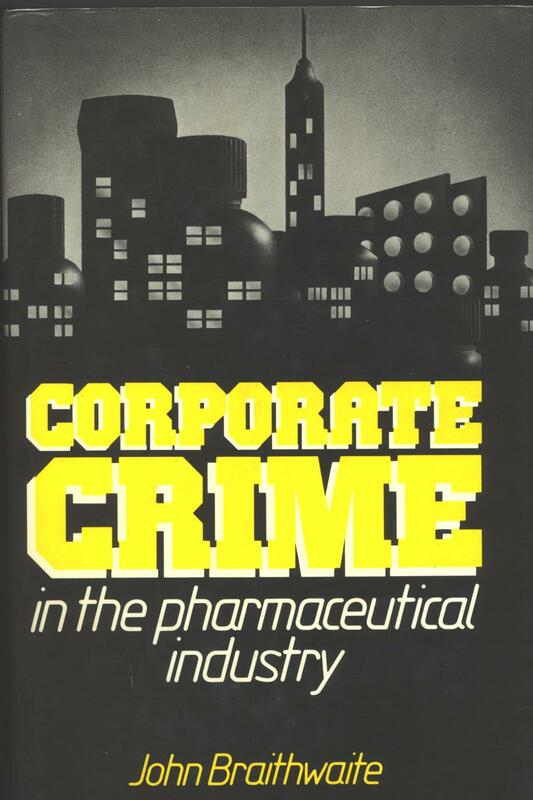 B. Fisse and J. Braithwaite (1993) Corporations, Crime and Accountability. Cambridge University Press. J. Braithwaite (1993) ‘Crime and the Average American: Review Essay’ Law and Society Review 27(1), 215-231 (Reprinted in M. Levi (ed.) Fraud: Organization, Motivation, Control, Vol II. Aldershot: Ashgate). 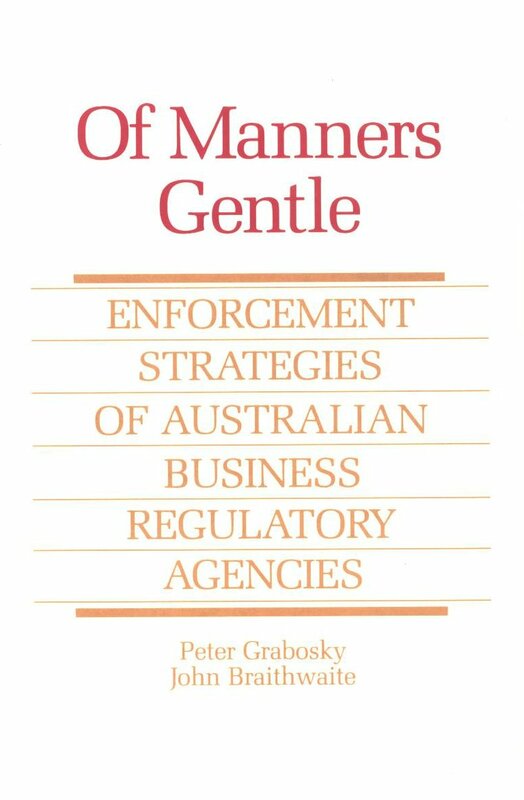 J. Braithwaite (1992) Penalties for White Collar Crime in P. Grabosky (ed.) Complex Commercial Fraud, 167-171. Canberra: Australian Institute of Criminology. J. Braithwaite (1991) ‘The Criminal Class and the Making and Breaking of Australia’ Australian and New Zealand Journal of Criminology, 24, 99-104. J. Braithwaite (1991) ‘Poverty, Power, White-Collar Crime and the Paradoxes of Criminological Theory’ Australian and New Zealand Journal of Criminology, 24, 40-50. (Revised version reprinted in K. Schlegel and D. Weisburd (eds) (1992) White Collar Crime Reconsidered. Boston: Northeastern University Press. Unrevised version reprinted in M. McShane and F. Williams III (ed.) (1997) Criminal Justice: Contemporary Literature in Theory and Practice. Hamden, Connecticut: Garland Publishing). J. Braithwaite (1991) ‘Preface’ in R. Scheff & S. Retzinger (eds) Shame, Violence and Social Structure. Lexington: Lexington Books. J. Braithwaite & B. Fisse (1990) On the Plausibility of Corporate Crime Theory in W. Laufer & F. Adler (eds) Advances in Criminological Theory Vol 2, 15-38. New Brunswick: Transaction Publishers (Reprinted in Japanese in Kokushikan Law Review, 1992, 15: 149-177) and also reprinted in G. Geis, R.F. Meier and L. Salinger (eds) (1995) White-Collar Crime: Classic and Contemporary Views, 3rd Edition. New York Free Press). J. Braithwaite (1989) ‘Criminological Theory and Organizational Crime’ Justice Quarterly 6(3), 401-25. (Reprinted in D Nelken (ed.) (1994) White Collar Crime. Aldershot: Dartmouth; reprinted in H. Croall (ed.) (2009) Corporate Crime. Sage Publications). J. Braithwaite (1988) ‘White-Collar Crime, Competition and Capitalism: Comment on Coleman’ American Journal of Sociology 94, 627-32. B.Fisse & J. Braithwaite (1988) ‘The Allocation of Responsibility for Corporate Crime: Individualism, Collectivism and Accountability’ Sydney Law Review 11, 468-513. J. Braithwaite & B. Fisse (1988) ‘Preventive Law and Managerial Auditing’ Managerial Auditing Journal 3(1), 17-20. B. Fisse & J. Braithwaite (1988) Accountability and the Control of Corporate Crime: Making the Buck Stop in M. Finlay and R. Hogg (eds) Understanding Crime and Criminal Justice, 93-127. Sydney: Law Book Company. P. Grabosky, J. Braithwaite & P. Wilson (1987) ‘The Myth of Community Tolerance Toward White-Collar Crime’ Australia and New Zealand Journal of Criminology 20, 33-44 (Reprinted in M. Levi (ed.) (1999) Fraud: Organization, Motivation, Control, Vol II. Aldershot: Ashgate). J. Braithwaite, B. Fisse & G. Geis (1987) ‘Covert Facilitation and Crime: Restoring Balance to the Entrapment Debate’ Journal of Social Issues 43(3), 5-42. J. Braithwaite, B. Fisse & G. Geis (1987) ‘Overt Observations on Covert Facilitation: A Reply to the Commentators’ Journal of Social Issues 43(3), 101-122. 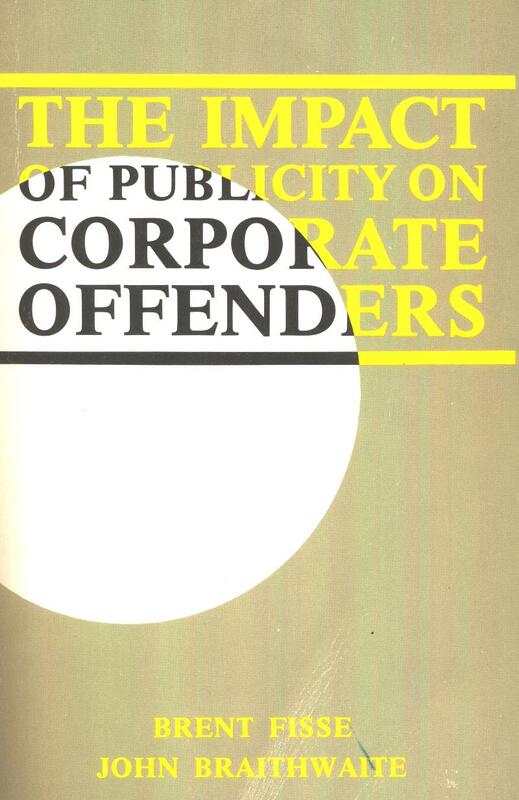 B.Fisse & J. Braithwaite (1987) Corporate Offences: The Kepone Affair in R. Weston (ed.) Combatting Commercial Crime. Sydney: Law Book Co.
B. Fisse and J. Braithwaite (1987) Ford Motor Company and the Pinto Papers in M.D. Ermann and R.J. Lundman (eds) Corporate and Governmental Deviance, 3rd edition. New York: Oxford University Press. J. Braithwaite, P. Grabosky and D. Rickwood (1986) ‘Research Note: Corruption Allegations and Australian Business Regulation’ Australian and New Zealand Journal of Criminology 19, 179-186. J. Braithwaite (1986) ‘Consumers as Victims of Corporate Crime’ in E. Wheelwright (ed.) Consumers, Transnational Corporations, and Development; Volume VIII in the series Transnational Corporations in SE Asia, University of Sydney, Transnational Corporations Research Project. J. Braithwaite (1986) Taking Responsibility Seriously: Corporate Compliance Systems in Brent Fisse and Peter French (eds) Corrigible Corporations and Unruly Law. San Antonio, Trinity University Press. P. Grabosky & J. Braithwaite (1986) Corporate Crime and Governmental Response in Australia in D. Chappell and P. Wilson (eds) The Australian Criminal Justice System, 84-96, 3rd Edition. Sydney: Butterworths. J. Braithwaite (1985) ‘White Collar Crime’ Annual Review of Sociology 11, 1-25. (Reprinted in G. Geis, R.F. Meier and L. Salinger (eds) (1995) White- Collar Crime: Classic and Contemporary Views, 3rd Edition. New York: Free Press; and D. Nelken (ed.) White Collar Crime. Aldershot: Dartmouth, 1994). J. Braithwaite (1985) ‘Corporate Crime Research: Why Two Interviewers are Needed’ Sociology 19(1), 136-138. J. Braithwaite and S. Vale (1985) ‘Law Enforcement by Australian Consumer Affairs Agencies’ Australian and New Zealand Journal of Criminology 18, 147-163. B. Fisse & J. Braithwaite (1984) Sanctions Against Corporations: Dissolving the Monopoly of Fines in R. Tomasic (ed.) Business Regulation in Australia, 129-145. Sydney: CCH Australia. J. Braithwaite (1982) ‘Enforced Self-Regulation: A New Strategy for Corporate Crime Control’ Michigan Law Review 80, 1466-1507. J. Braithwaite & G. Geis (1982) ‘On Theory and Action for Corporate Crime Control’ Crime and Delinquency, April, 292-314. (Reprinted in part as ‘Stricter Penalties Would Reduce Corporate Crime’ in C. Debner, T. O’Neill & B. Szumski (eds) (1984) Crime and Criminals: Opposing Viewpoints, 2nd ed. St Paul: Greenhaven Press, 115-119. Also in A. Duff (ed.) (1993) Punishment. Aldershot: Dartmouth, 280-311; N. Shover and J.Wright (eds.) (2000) Crimes of Privilege: Readings in White-Collar Crime. New York: Oxford University Press; H. Croall (ed.) (2009) Corporate Crime. London: Sage Publications). J. Braithwaite & G. Geis (1982) ‘On Theory and Action for Corporate Crime Control’ in G. Geis (ed.) On White-Collar Crime. Lexington, Mass: Lexington Books (reprinted with modifications from Crime and Delinquency). J. Braithwaite (1981) ‘The Limits of Economism in Controlling Harmful Corporate Conduct’ Law and Society Review 16(3), 481-504. J. Braithwaite (1980) ‘Inegalitarian Consequences of Egalitarian Reforms to Control Corporate Crime’ Temple Law Quarterly 53, 1127-1146. J. Braithwaite (1979) ‘Transnational Corporations and Corruption: Toward Some International Solutions’ International Journal of the Sociology of Law 7, 125-142. J. Braithwaite (1978) An Exploratory Study of Used Car Fraud in P.R. Wilson and J. Braithwaite (eds) Two Faces of Deviance: Crimes of the Powerless and Powerful, 101-121. Brisbane: University of Queensland Press. J. Braithwaite & P.R. Wilson (1978) ‘Pervs, Pimps and Power-Brokers’ in P.R. Wilson and J. Braithwaite (eds) Two Faces of Deviance: Crimes of the Powerless and Powerful, 1-12. Brisbane: University of Queensland Press.